Lembi Buchanan is a passionate mental health advocate working on behalf of persons with severe mental illness to ensure that they are not discriminated against by government programs and policies. 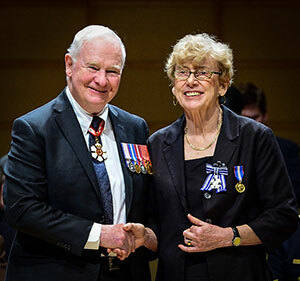 She was recently awarded the Meritorious Service Medal by The Governor General of Canada, His Excellency the Right Honorable David Johnston, recognizing her outstanding contribution to the country. Her dedication and perseverance lobbying the federal government have helped ensure fair tax treatment for some of the most vulnerable members of our society. Lembi began advocating for the reform of the federal Disability Tax Credit (DTC) for people in 2001. Canada Revenue Agency (CRA) was routinely denying the credit for people with mental illnesses including her husband who is diagnosed with bipolar disorder. She appealed to the Tax Court of Canada on his behalf and the landmark case was upheld by the Federal Court of Appeal. The unanimous decision was written by Justice Marshall Rothstein who was later appointed to the Supreme Court of Canada. In 2017, Lembi renewed her “Fighting for Fairness” because of a substantial body of evidence that the CRA was abusing its mandate and denying eligible DTC claims without justification. She founded the Disability Tax Fairness Alliance with Peter Weissman, former chair of the Disability Advisory Committee. The Alliance successfully appealed to the Minister of National Revenue, the Honorable Diane Lebouthillier to reinstate the Disability Advisory Committee and as a member, Lembi continues to ensure that people living with mental illness are not discriminated against because of a lack of understanding of the challenges they face in their daily lives. As a member of the Alliance for Access to Psychiatric Medications which is affiliated with the Best Medicines Coalition, Lembi advocates for access to new and innovative medications for the treatment of schizophrenia and bipolar disorder in provincial formularies. She also contributes to the current discussions of a proposed National Pharmacare plan for Canada. In the 1980s and 1990s, Lembi worked closely with the mining sector in Elliot Lake, Ontario, providing research, report, newsletter and speech writing services focusing on community concerns and environmental issues. She was also manager of a major manufacturer of filtration products for the resource industry as well as coordinating and implementing proactive communications strategies to strengthen business and manufacturing opportunities when faced with the end of the mining boom that dominated the city’s economy until 1995. Lembi has received several awards for advocating on behalf of persons living witih disabilities including the City of Toronto Access Award for Disability Issues in December 2001 and the Queen's Jubilee Medal in October 2002.